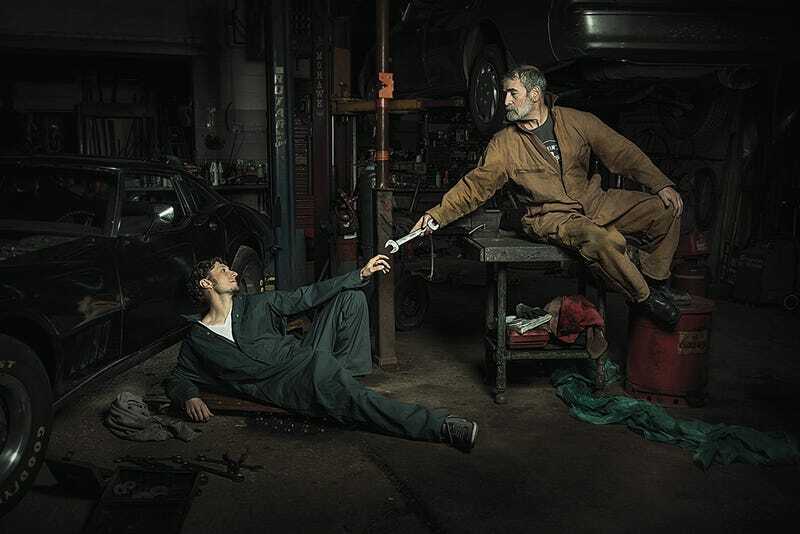 Photographer Freddy Fabris specializes in images of cars and people. When he stepped into one particular auto shop and inspiration hit him to take a new spin on an old theme, and it’s pretty awesome. “For many years I wanted to pay homage the great Renaissance masters,” Fabris himself writes in a recent Huffington Post article on the work. Like any parody, Fabris’ goal was “to take [these images] out of their original context, yet maintain their essence.” I mean, clearly he nailed it. The American Photographic Artists group has featured Fabris, highlighting these images and some other incredible sports-portraits he’s shot won (check those out on his website!) He’s won 1st Place International Color Award, the One Eyeland Silver Award, and the APA Conceptual Award, so I guess we’re not the first to discover him. These images were actually shot over a year ago but I think Jalopnik readers will have a special appreciation for his work. In the style of The Last Supper (Leonardo da Vinci). In the style of The Anatomy Lesson of Dr. Nicolaes Tulp (Rembrandt). Images by Freddy Fabris posted with permission.